The bill extends the retirement date of the shuttle program from February to June. (CNN) -- Congress has passed a $19 billion bill authorizing NASA to launch an additional shuttle mission and to develop a heavy-lift vehicle. Late Wednesday, the House passed the NASA Reauthorization Act following the Senate's approval, giving NASA the authority to move forward with President Barack Obama's strategy for the agency, including encouraging commercial development of space transportation systems. "We want to thank Congress for NASA's future," Lori Garver, NASA's deputy administrator, said during a media teleconference Thursday. "It puts NASA programs on a more sustainable future," said Garver. The bill overwhelming passed both houses of Congress and Obama is expected to sign it. The exact amount of money each NASA program receives will be decided by congressional appropriations, but not until after the November elections. 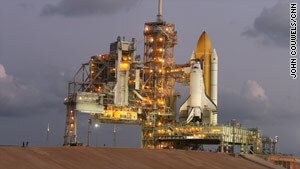 The bill authorizes an additional shuttle launch, extending the retirement date of the shuttle program from February 2011 until June 2011. The NASA administrator said an additional shuttle mission could help stock additional supplies on the international space station. The bill extended the space station's life five additional years, until 2020. It's expected as the shuttle program comes to an end that more than 9,000 shuttle workers will lose their jobs. The NASA deputy administrator said she didn't believe this bill would affect planned layoffs, "certainly not for tomorrow." More than 1,200 shuttle workers are to be laid off on Friday. Thursday was the last day for laid-off employees to report to their workstations. Shuttle workers on their last day were to receive their final paperwork. Many of the departing workers have worked on the shuttle program since its beginning. A spokeswoman for one of NASA's primary contractors at the John F. Kennedy Space Center in Florida, United Space Alliance, said "it's too early to tell what, if any, impact" the congressional appropriation may have on workforce levels in the months ahead. "The authorization bill will not have an impact on this Friday's layoff, but it will result in adjustments to our plans for the timing and magnitude of future workforce reductions," said Tracy Yates of United Space Alliance, the primary contractor being affected by the layoffs Friday. Yates added that the development of a heavy-lift vehicle "should offer promising opportunities and future work for United Space Alliance." An official of an association representing commercial space flight contractors hailed the new strategy of government encouragement for commercial companies to develop systems for transporting astronauts and cargo to the space station. "America's space industry is taking a quantum leap forward with this historic shift," said John Gedmark, executive director of the Commercial Spaceflight Federation. "This bill will allow multiple private companies to move forward with developing this capability," he said, adding that tax money will be saved and "thousands of new high-tech jobs" will be created in those companies.